Batley Bulldogs player Louis Jouffret was given a special welcome back to the UK. Batley Bulldogs offered a unique way of welcoming French international half-back Louis Jouffret back to the club last weekend. 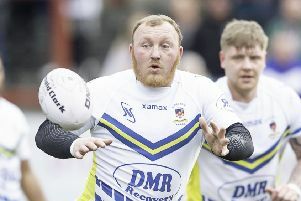 Jouffret joined the Bulldogs in July and produced a string of scintillating performances to help Batley win their final six matches of the season. Having committed himself to the Bulldogs for the 2019 campaign, Jouffret was due to re-join the squad this week. Batley took to Twitter with a video to welcome their star back, which has gained a brilliant response from the rugby league world. The video shows club mascot Battler The Bulldog being sent by head coach Matt Diskin to pick up the French player from Manchester Airport last Sunday. Having driven across a rain lashed M62, Battler welcomes Jouffret through the terminal waving the French national flag. The one minute, 40 second long video has earned praise from Batley supporters, while a number of other Championship clubs have congratulated the Bulldogs on a brilliant marketing ploy. The video can by viewed by visiting the club’s Twitter account @BatleyRLFC.